Credit: 358661Robert Laberge/Getty Images Joey Logano, driver of the #22 Shell Pennzoil Ford, celebrates in victory lane after winning the Monster Energy NASCAR Cup Series Ford EcoBoost 400 and the MENCS Championship at Homestead-Miami Speedway on November 18, 2018 in Homestead, Fl. You could not of asked for a better end then they the Final Championship 4 starting at the last re-start. It was exciting with 1st Car 18 Kyle Busch M&M’s Toyota, 2nd place Car 78 Martin Truex Jr. Bass Pro Shops/5-hour ENERGY Toyota, 3rd place Car 22 Joey Logano Shell Pennzoil Ford & in 4th place Car 4 Kevin Harvick Jimmy John’s Ford. Car 78 Martin Truex Jr. Bass Pro Shops/5-hour ENERGY Toyota grabbed the lead from Car 18 Kyle Busch M&M’s Toyota until Car 22 Joey Logano Shell Pennzoil Ford took the lead from him to the checkered flag. 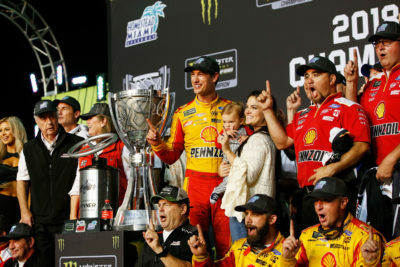 Starting from 5th place Car 22 Joey Logano Shell Pennzoil Ford won the 20th Annual Ford EcoBoost 400, his 21st win in 363 NASCAR Monster Energy Cup Series races. This is his 3rd win & 26th Top 10 finish in 2018. 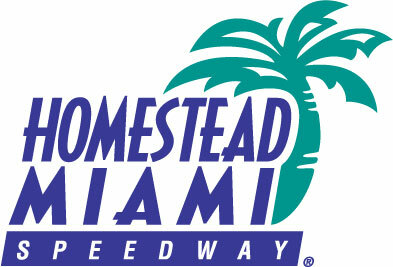 This is his 1st win & 5th Top 10 finish in 10 races at Homestead-Miami Speedway. Joey Logano has won the 2018 Monster Energy NASCAR Cup Series driver championship. Team Penske has won the 2018 Monster Energy NASCR Cup Series owners championship. 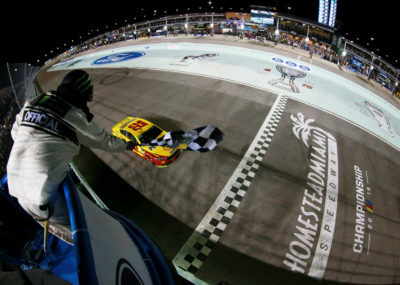 Credit: 358654Sean Gardner/Getty Images Joey Logano, driver of the #22 Shell Pennzoil Ford, takes the checkered flag to win the Monster Energy NASCAR Cup Series Ford EcoBoost 400 and the MENCS Championship at Homestead-Miami Speedway on November 18, 2018 in Homestead, Florida. 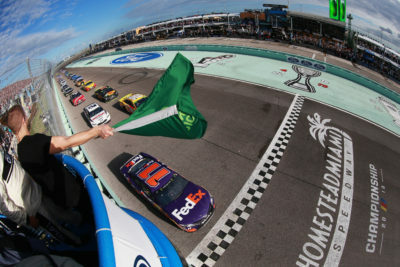 Credit: 358660Sean Gardner/Getty Images Denny Hamlin, driver of the #11 FedEx Express Toyota, leads the field past the green flag to start the Monster Energy NASCAR Cup Series Ford EcoBoost 400 at Homestead-Miami Speedway on November 18, 2018 in Homestead, Florida. Ford, started from 10th place. Lastly in the Top 10 Car 41 Kurt Busch Haas Automation/Monster Energy Ford, in 10th place, started from 6th place. William Byron has won the 2018 Monster Energy NASCAR Cup Series Sunoco Rookie of the Year honors. 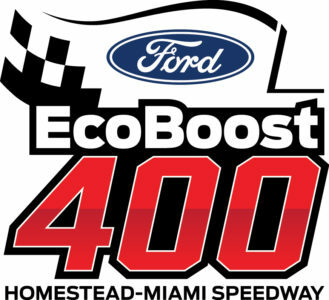 Ford has won the 2018 Monster Energy NASCAR Cup Series manufacturers championship. 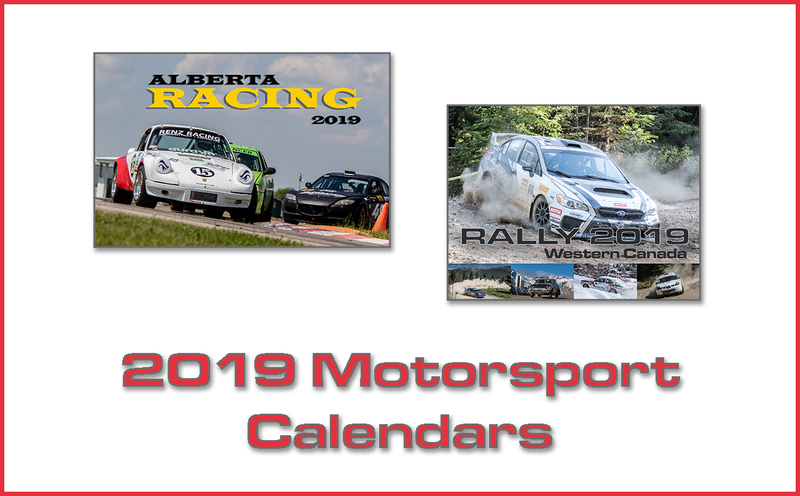 All 3 NASCAR Series the driver that won the final race also won the championship, Monster Energy NASCAR Cup Series, NASCAR XFINITY Series & NASCAR Camping World Truck Series. Joey Logano has won his first Monster Energy NASCAR Cup Series championship, becoming the 33rd different series champion. Logano is the fifth different driver to win the series championship in the elimination-style Playoff format joining Kevin Harvick, 2014; Kyle Busch, 2015; Jimmie Johnson, 2016 and Martin Truex Jr., 2017. Logano won the Monster Energy NASCAR Cup Series season finale to claim the 2018 title. Logano finished the 2018 season with three wins, 13 top fives, 22 top 10s and a pole. During the Playoffs this season, Logano has produced two wins, six top fives, eight top 10s a pole. 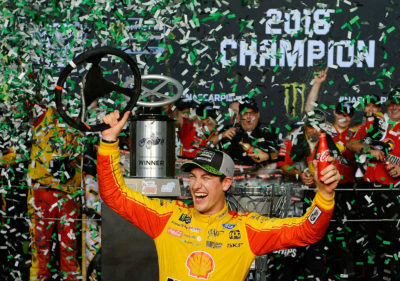 Joey Logano (Middletown) is the first driver from the state of Connecticut to win a Monster Energy NASCAR Cup Series championship. This is Team Penske’s second Monster Energy NASCAR Cup Series driver and owner championship – previous title: 2012 with driver Brad Keselowski. This is Team Penske’s sixth NASCAR national series owner championship (two in the MENCS; four in the NXS). Team Penske has won 111 Monster Energy NASCAR Cup races. Todd Gordon has won his first Monster Energy NASCAR Cup Series championship. Gordon’s previous best standings finish was runner-up in 2016 with Joey Logano. Gordon is the 42nd different Monster Energy NASCAR Cup Series crew chief to win a championship. Gordon has 19 career Monster Energy NASCAR Cup Series wins, all with Joey Logano. Credit: 358670Chris Trotman/Getty Images Joey Logano, driver of the #22 Shell Pennzoil Ford, celebrates with his wife, Brittany, and son, Hudson, after winning the Monster Energy NASCAR Cup Series Ford EcoBoost 400 at Homestead-Miami Speedway on November 18, 2018 in Homestead, Florida. The race had 5 Cautions for 26 Laps: 1st Caution on lap 82 for Stage 1 Conclusion. 2nd Caution on lap 140 for Debris Frontstretch. 3rd Caution on lap 162 for Stage 2 Conclusion. 4th Caution on lap 194 for #42 Crash in Turn 4. 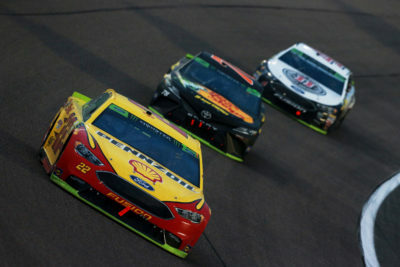 5th Caution on lap 248 for #2, 19 Crash in Turn 1.
Credit: 358657Sean Gardner/Getty Images Joey Logano, driver of the #22 Shell Pennzoil Ford, Martin Truex Jr., driver of the #78 Bass Pro Shops/5-hour ENERGY Toyota, and Kevin Harvick, driver of the #4 Jimmy John’s Ford, race during the MENCS Ford EcoBoost 400 at Homestead-Miami Speedway. 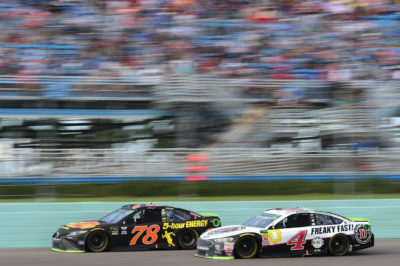 The race had 22 Lead Changes among 7 drivers: D. Hamlin 1-36; M. Truex Jr. (P) 37-39; M. McDowell 40-41; D. Hamlin 42; K. Harvick (P) 43-82; K. Larson 83; K. Harvick (P) 84-86; K. Larson 87-90; J.Logano (P) 91-104; K. Larson 105-117; K. Harvick (P) 118-119; M. Truex Jr. (P) 120; D. Hamlin 121-124; K. Larson 125-147; K. Harvick (P) 148-159; K. Larson 160-163; J. Logano (P) 164-166; K.
Harvick (P) 167; J. Logano (P) 168-218; M. Truex Jr. (P) 219-230; K. Busch (P) 231-251; M. Truex Jr. (P) 252-255; J. Logano (P) 256-267.
Credit: 358658Jared C. Tilton/Getty Images Martin Truex Jr., driver of the #78 Bass Pro Shops/5-hour ENERGY Toyota, and Kevin Harvick, driver of the #4 Jimmy John’s Ford, race during the MENCS Ford EcoBoost 400 at Homestead-Miami Speedway on November 18, 2018 in Homestead, FL. 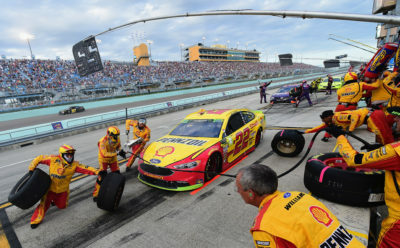 Credit: 358659Jared C. Tilton/Getty Images Joey Logano, driver of the #22 Shell Pennzoil Ford, pits during the Monster Energy NASCAR Cup Series Ford EcoBoost 400 at Homestead-Miami Speedway on November 18, 2018 in Homestead, Florida. Race Comments: Prior to the start of the race, no cars dropped to the rear of the field under penalty. Failed to Qualify: N/A. Time of Race: 3 Hrs, 00 Mins, 36 Secs. Average Speed: 133.056 MPH. Margin of Victory: 1.725 Seconds. Caution Flags: 5 for 26 laps: Laps. Lead Changes: 22 among 7 drivers.